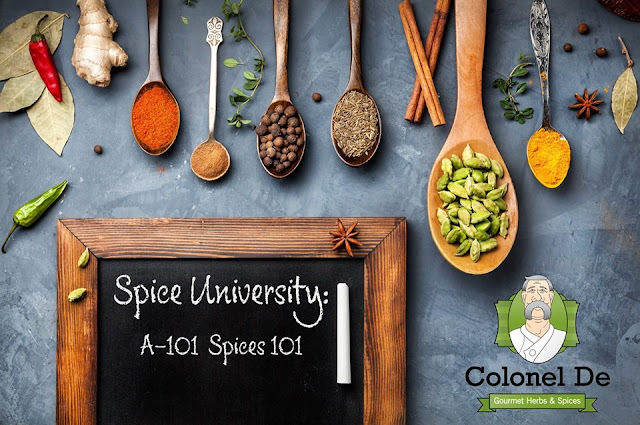 Spice University: Classes from Colonel De's | The Food Hussy! Over the past few months - I've gotten pretty chummy with a cool dude named Colonel De. He's a super interesting guy that has built an amazing company from the ground up - and now he's got a store in Ft Thomas - his third location - and he's sharing his wealth of knowledge with us. The new location in Fort Thomas is adorable - it's got a great storefront and then in the middle area is where the classroom is and the back is where the magic happens. They put together all of the spice blends in the back of the Fort Thomas location for all three of their retail locations (Fort Thomas, Findlay Market & Jungle Jims Eastgate). Colonel De's has started teaching classes at his various locations and I was honored to be offered the first class for free to check it out and share with you. First up was Spices 101. We had a load of spices we were about to try - there were 4-5 rows just like this one - and Colonel De explained each and every one to us. * Keep spices away from heat, moisture and sunlight. That means storing them near the stove is a bad idea (doh! He was talking to me!). * Spices & herbs don't spoil - they just lose their strength. * Members of the red pepper family (including paprika & chili powder) keep their color and stay fresher when stored in the refrigerator. He shared many more but those are just a few. 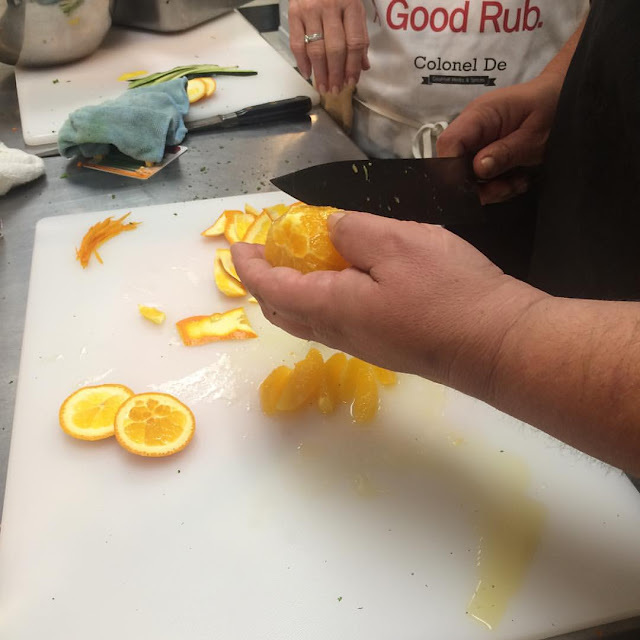 Colonel De was giving us so much knowledge - he gave us the story of how he got his start and his love for spices. We also learned things like spices that you buy in the grocery store are already 6+ months old. The thing is - spices lose their flavor the longer they sit on the shelf. The Colonel gets his spices much closer to their harvest and gets them on the shelf much quicker. What that means is more potent spices for you and more flavor in your food. There's no way I can tell you about all the spices we tried - but I will give you one tip - Persian Lime. This was limey and salty and amazing! I wanted to combine this with the Adobo seasonings and use it on Chicken - it would be so freakin delicious! Here is a smattering of the spices we tried - and while dry spices don't always taste great on their own - it was really interesting to be able to smell them all and then think about how I could use them. * Cloves is Latin for the word nail - hmm - who knew?! * Epazote smells like turpentine but prevents farting! I mean - I just dropped some serious knowledge on you - and that's just a touch of what I learned. A bargain at $20! Class 201 in Spice University was on Knifing Skills - I was unfortunately busy that night and I want to spread the spice love around - so I sent my friend Brenda in my place. Being a left-handed person in the kitchen can get a little tricky and I love to cook. Anytime I can learn something new that saves me time while making dinner really helps. It was so much fun slicing and dicing tons of vegetables. I even learned how to quickly prepare zucchini for zucchini fries. Typically I have a hard time following along but this class was just the right speed. And I loved that we were fed after! Plus there was plenty of time to ask spicy questions while we ate. I would highly recommend this class to others who want to pick up some great tips. 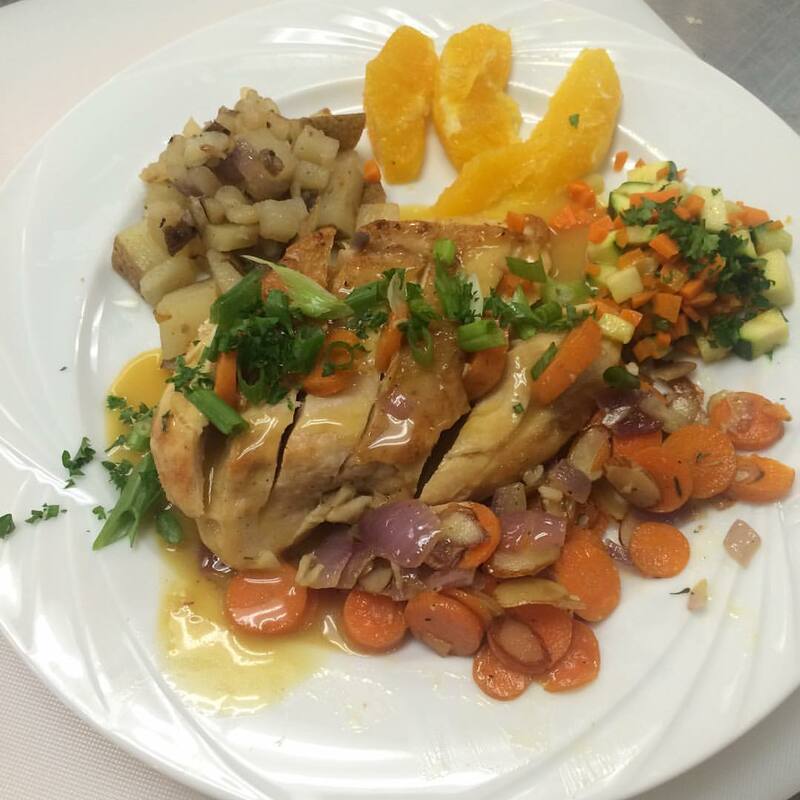 We all need some practice in the kitchen and the dinner was wonderful! Sounds like a ringing endorsement to me! And be sure to check out Colonel De's upcoming class schedule - there are some good things coming up - including Spices 101 this week! Thanks again to Colonel De's for allowing us to try out these classes for free.